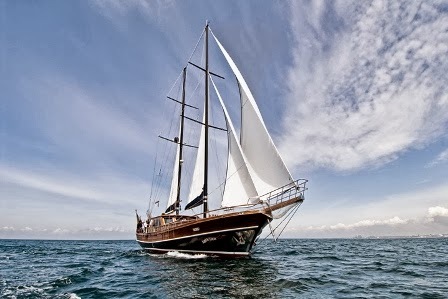 Available from now till 15 December in Naples.Exceptional rate of € 10.000 Wk + Vat. Short Charters are also welcome. Santa Lucia, built in 2006, 26 meters, offers a perfect combination of tradition, elegance and security guaranteed by the most modern technologies. Both the hull and her interior is entirely made from high grade mahogany. Santa Lucia offers style and comfort for a journey to rediscovery emotions. Her salon has a comfortable semi circular crème sofa and a dining table where you can easily taste the Mediterranean and International cuisine of the chef or just relax with a good book. She has 2 double and 2 twin cabins each equipped with: TV LCD, air conditioning, dvd/dvx/mp3 player and private bathroom. She offers wide space to sunbathe on comfortable cushions on all area and a big table where you can dine under the stars. two Masters and two double cabins, all with private bathroom, air conditioning, stereo, plasma TV and ample space for wardrobes.